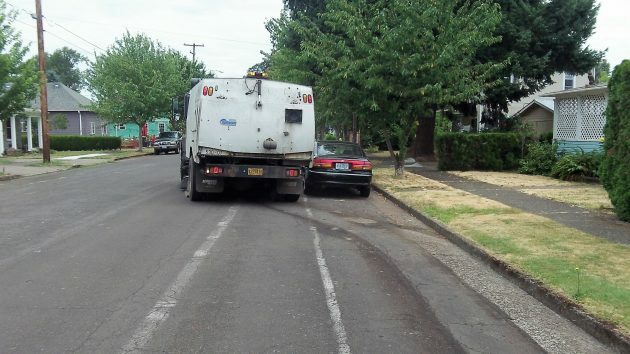 The Albany street sweeper steers around yet another obstacle on Thursday. 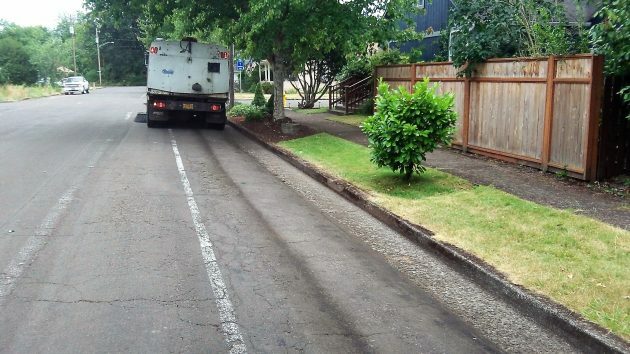 Unlike the neatness police in some cities elsewhere, the Albany City Council has seen fit not to prohibit curbside parking on the days when the sweeper makes his rounds. Presumably that’s because the council is considerate and doesn’t want to pile yet another requirement or rule on residents and taxpayers of the town. A one-day-a month parking ban would necessarily be violated because people would forget. Or they would just ignore it. Then there would have to be enforcement — tickets and fines. Who needs the hassle? So it’s up to people to show a little foresight on their own. It’s easy. On its website, the city of Albany has published a street-sweeping map and schedule. On the map, you find the neighborhood where you live. On the schedule below the map, you learn the date when sweeping is done each month. If you live in the Willamette Neighborhood, for instance, that puts you in Area C, one of 14 zones covering the city. The schedule shows that in July, the sweeping day was Thursday, the seventh. In North Albany, the Benton Woods subdivision is in Zone E, and this month the sweeping date is the 12th. And so forth. The schedule also lists the 20 major streets where sweeping takes place every other Monday. I don’t know how much Albany spends on sweeping the streets. The budget doesn’t say (or if it does, I couldn’t find it). The budget does list the expense of “sweeper debris” as $35,000, presumably meaning the bill for taking it to the dump. Speaking of debris, the budget says the city wants to “develop a sweeper debris recycling program.” Really? Clear sailing and a straight shot on this part of Front Avenue. It would be nice if they did an extra sweep each month on some of the major bike routes. Pacific/9th, Salem, Santiam, Waverly etc. Some are “state highways” whereas the city is afraid to confront the state about “infringing” on their “territory”, cyclists be damned. Geary St- Usually pretty decent. Hill St.- Too rough S of Queen and frequent glass/ceramic debris near the Boys Club. Waverly Dr- Apparently they don’t like to get close to the curb in parts. Pacific, near Goodwill, can be “filthy” with headlight/taillight remains etc. Santiam can be especially filthy from 9th street on out past Fred Meyer. Often, it’s small stuff that you wouldn’t see in a car.